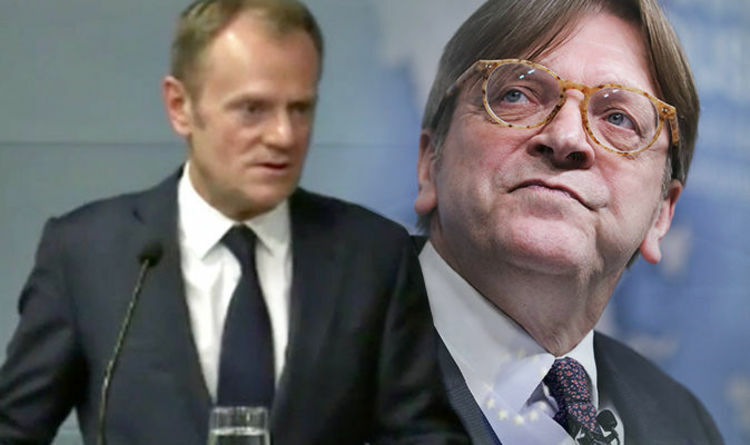 Arch-federalist Guy Verhofstadt unveiled splits in the European Union with his proposals for a much softer Brexit arrangement between Brussels and London. The European Parliament's Brexit coordinator suggested the EU could seek to strike an "association agreement" with Britain to maintain closer ties after Brexit – but he was solemnly shut down by European Council boss Donald Tusk. Mr Tusk said: "Unfortunately what we are working on is kind of a dissociation agreement, not an association agreement. "Brexit, the decision of the British referendum, was about dissociation, not association." Mr Verhofstadt wants the ‘association agreement’ to include access to European bodies like the European Medicines Agency after Brexit. The plans for closer ties paves the way for a closer, more flexible and dynamic relationship between Britain and the EU. But Mr Tusk dismissed his proposals, promising to explain to his colleague the purpose of Brexit. Talking to the press, Mr Tusk said: "Dissociation is the first and most natural consequence of Brexit, this is the essence of Brexit. "I will try to explain this also to my friend Guy Verhofstadt." Mr Verhofstadt’s spokesman Bram Delen however played down talk of splits in Europe’s Brexit stance. He said: “It’s not a matter of good cop/bad cop. “The European Parliament wanted to find a way forward between the red lines of the UK government on the one hand and on the other hand the principles of our Union.